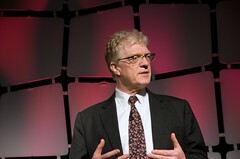 Another inspiring talk from Sir Ken Robinson through TED, again calling for a revolution in education delivery. At first glance, education might seem to have little to do with child survival, and in the context of this talk that is largely true. However, towards the end of the talk, he speaks about the role of culture and leadership for creating change. Inspiring stuff, and lessons we can use in other areas and not only in changing education. Great presentation technique. I don’t think he took one step in all 19 minutes of speaking. No powerpoint. Just the appeal of personality and persuasion through reasoned argument. (Paraphrased) The culture is absolutely essential…Right near the surface are seeds of possibility waiting for the right conditions come about in order to spring to life…. Not ‘Command and Control’, but the real role of leadership is ‘Climate Control’. Creating a climate of possibility. Benjamin Franklin said there are three sorts of people in the world: there are people who are unmovable…, people who are movable…, and there are people who move. This is what we need for a revolution. Move leaders who move. This entry was posted in Ken Robinson, Possibility, TED and tagged Benjamin Franklin, Ken Robinson, TED.